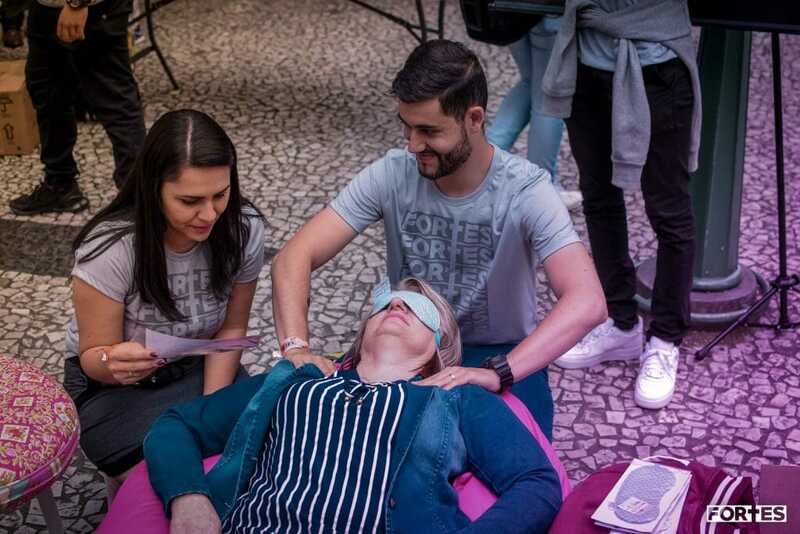 Thousands of young people paraded down the main pedestrian street of Curitiba in southern Brazil, setting up a health fair that taught residents about natural remedies and the benefits of healthy living, on November 17, 2018. Organizers estimate that about 7,000 Seventh-day Adventist young people from the southern states of Paraná, Santa Catarina, and Rio Grande do Sul took part in the activity, on the third day of a regional camporee being held nearby. “The focus of [the camporee] activities is getting involved to share the good news of the gospel wherever you are,” organizers said. As a way of reaching out to a sizable number of people in that city of 1.9 million residents, a massive health fair was put together along the city’s main street. There, young people shared the benefits of natural remedies — pure air, sunlight, water, rest, temperance, faith, physical exercise, and healthy eating. The November 17 health fair was not just based on technical presentations. Passers-by were invited to stop and take part, for instance, in physical activities with different degrees of complexity. In the area focused on rest, reclining couches were set up, as residents were invited to take a break and sit for a while. And as an extra perk, every person who accepted the offer was also offered a free massage. At the same time, in several stops along the pedestrian route, dozens of young people offered free hugs and suggested exchanging fruits for cigarettes. In the section focused on healthy eating, passers-by were invited to sample vegetarian dishes and get recipes to try at home. Isabel Garcia was one of the passers-by who benefited from the Adventist young people’s initiative. She had come downtown to make a payment when she saw hundreds of young people on the pedestrian street. After going through some of the stations, Garcia said she agreed with what she had learned. “It’s something all of us really need — cut out sugar and drink lots of water,” she said. After concluding the health fair activities for the day, Adventist young people walked to a central square, a place where various demonstrations typically take place. There, they enjoyed a celebration service attended by church leaders and government officials, including Curitiba deputy mayor Eduardo Pimentel. Toward the end of the service, Cid Moreira, one of the most familiar voices in Brazil, read some excerpts from the Bible and the book The Great Controversy, by Adventist Church co-founder Ellen G. White. An original version of this story was posted on the South American Division news page.